On a weekend in July we went to Berlin with a group of swimming enthusiasts from Brussels. Our mission: bringing the Flussbad-Pokal (Flussbad-trophy) back home to the city without outdoor pools! In the end we didn’t succeed, more about it below, but we had some exciting and informative days in the outdoor swimming capital of Europe. Dramatic view on the crowd that gathered despite the cancellation of the swimming. Getting in contact with the locals. Everyone got the lyrics of the Flussbad anthem. No excuses for not singing! The choir under the direction of Barbara Morgenstern. And the red flag: no swimming! Guess who's supporting POOL IS COOL? 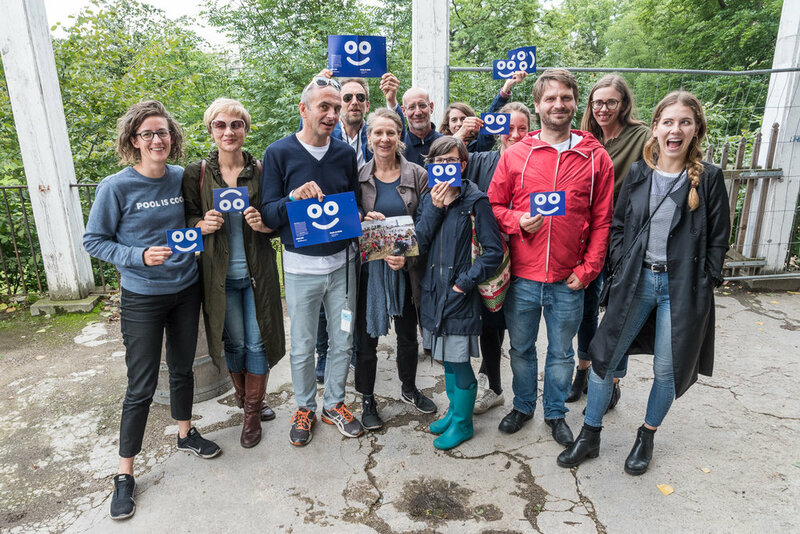 The team behind Flussbad Berlin! The Flussbad-Pokal is an annual event promoting the idea of the Flussbad Berlin: public swimming in a branch of the river Spree, naturally cleaned, in the middle of the city centre. While the realisation of this great idea is still some years ahead, the Flussbad-Pokal allows everyone to swim in the canal already now for one day. There are actually two heats: one serious one for the sporty swimmers aiming for the trophy and another relaxed swim for you and me and just the fun of it. Still it’s 1 km swimming, non stop! This was the idea, but the “Jahrhundertregen” (hundred year rain) on the day before the trophy rendered swimming in the canal impossible. 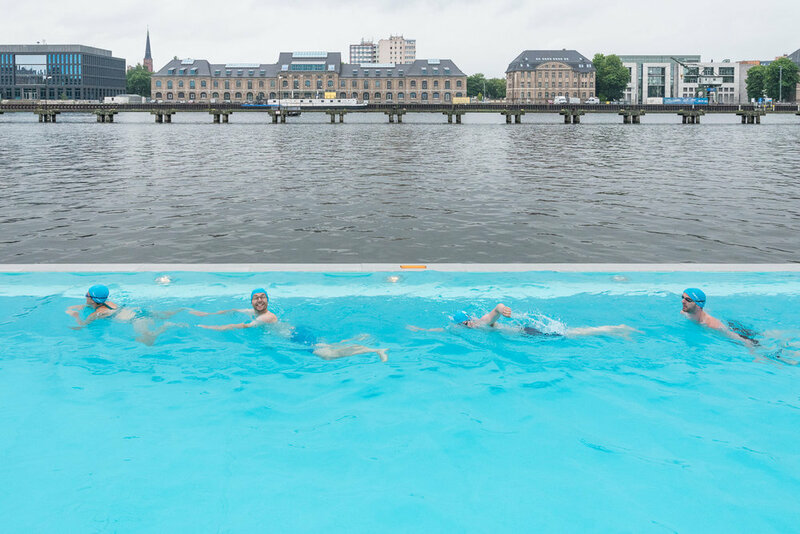 When it rains too heavy, the canalisation of Berlin flows over into the river, and that’s not only rain water … Under these conditions the water quality might have been too bad so the swimming itself got canceled for the sake of public health. Ironically, the day of the trophy started sunny! 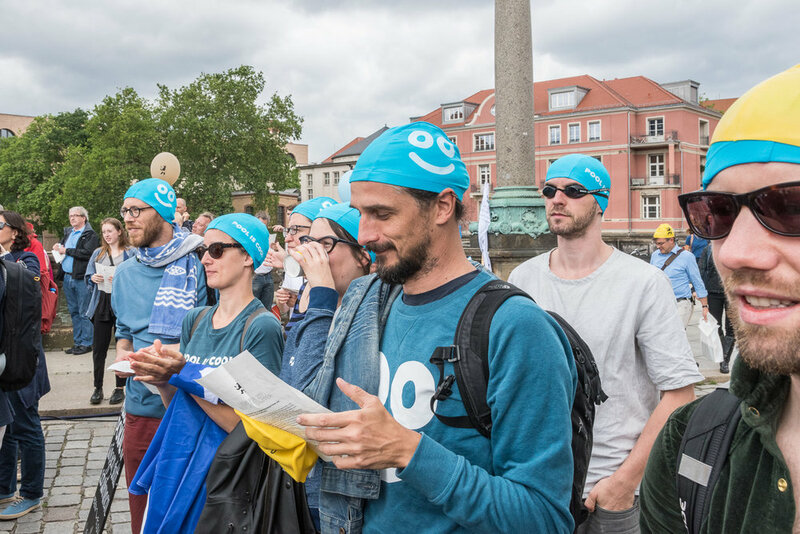 Together with 200 other Flussbad supporters we nonetheless met at the canal and celebrated the project under the motto “Singing instead of Swimming”. A choir under the lead of Barbara Morgenstern, electronic music artist from Berlin, prepared the Flussbad anthem which we all sang together while practicing dry swimming (something we’re really good in!). This was a surprisingly overwhelming moment, hearing all the voices sharing the dream of urban swimming. 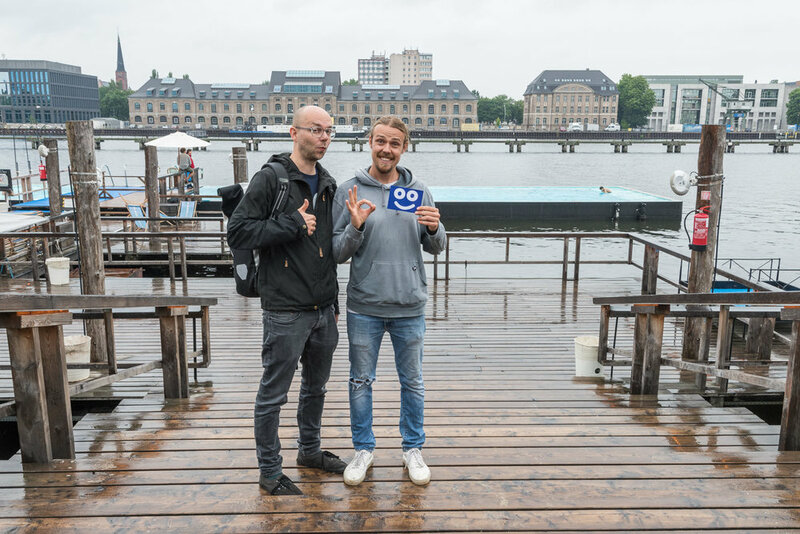 And while we couldn’t swim in the canal on this day, we still had the chance to meet the Flussbad Berlin team to share our experiences, some glasses and make friends. Still, we came to Berlin to finally practice real outdoor swimming. So in the afternoon we headed east to the famous Badeschiff. The Badeschiff is a floating pool in the river Spree. Opened in 2004 it became the role model of this type of pool. And luckily, despite the by now lousy weather, it was open. We were warmly received by Boy Jean, one of the responsibles of the Badeschiff, who gave us a tour of the whole area. The Badeschiff is not only the pool itself but also several wooden decks on the water for sunbathing, the beach area on the shore, an open cafe, a stage for concerts and events, a club, a grill, changing booths and showers and of course technical spaces. All this surrounded by old industrial buildings and the river with open views towards the city centre. The pool itself is floating on the river, held in place by steel cables which have to be adjusted according to the water level of the river. 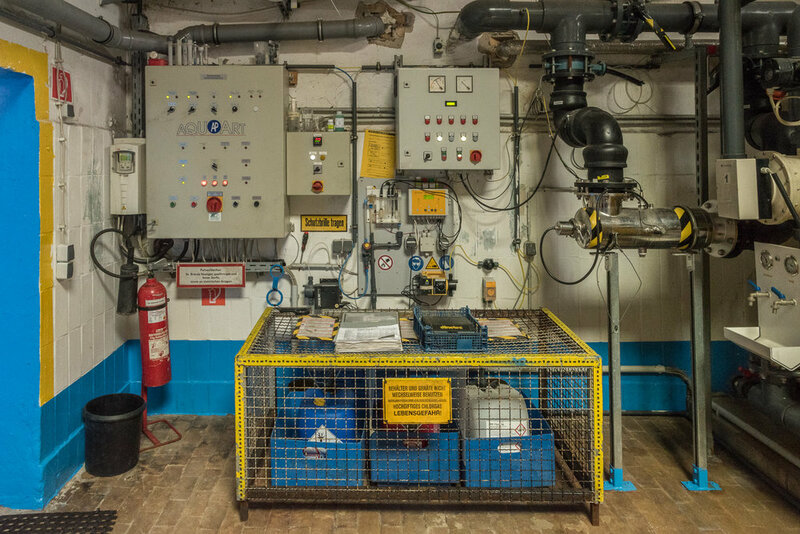 It’s connected to the technical area with the water filters via pipes under the wooden decks. The water is filtered by a classical system of sand filters and chemical disinfection, an impressive installation for a pool of 32 m length. There is also a first aid space and other service spaces. While there is no specific training for people working in swimming pools in Belgium, in Germany you have to follow a 3 year program to become a “Fachangestellter für Bäderbetriebe” (certified expert for bathing establishments). During this training, in parallel in a school and at the pool, you learn everything about the pool and its technical equipment but also financial knowledge, management skills and social competences. And only then you’re allowed to handle installations and people in a public bath. The Badeschiff in all its glory on a grey day, seen from the terrace of the club that belongs to the Badeschiff area. First we had a tour to the technical spaces. In yellow the huge sand filters. The technical installation that monitors the water quality and add the right amount of disinfection to the water. The back spaces of the Badeschiff for staff and first aid. There is obviously more to do than swimming. Boy Jean, who knows all about the Badeschiff, in action. No comments about the weather. No pool without pool rules. Kobe couldn't wait to get into the water. Thanks for the informative tour! ... joined Kobe for a swim! Us and a few other crazy swimmers. And there is a great view! The surrounding of the Badeschiff, seen from the pool. Once you're in it's really nice! The water was actually warmer than the air. After this exciting tour of the pool and its functioning, at least some of us were brave enough to take a dip in the pool itself while the others took shelter at the bar with a warm drink. The lonely lifeguard was happy that we gave his day meaning and we enjoyed the huge pool with the 5 of us. It’s certainly a recommendation to go for a swim on the rainy day. The temperature in the water is the same as on a sunny day, you anyway get wet and you’re the only one in the pool! 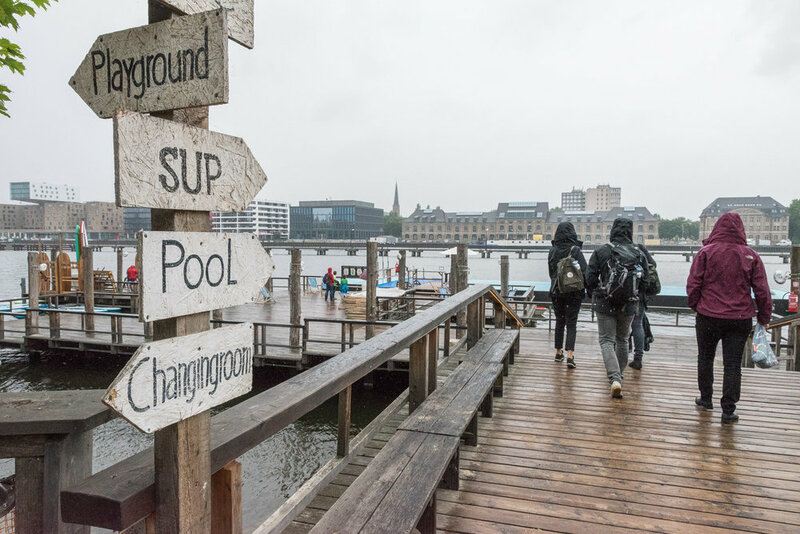 This grey day was certainly no financial success, but the privately run Badeschiff manages to run financially self sufficient while keeping the entrance fee on the level of the public pools (at the moment € 5,50 per day for adults). That’s only possible with the income of drinks, foods and events. We continued the discourse about finances and management on the following day with Matthias Oloew, the company spokesman of the Berliner Bäderbetriebe (public bath administration of Berlin). It’s a public company with 800 employees, running all the public pools, including more than 20 outdoor pools and beaches. He gave us interesting insights into the structure and functioning of a public administration of such size and answered specific questions regarding public open air pools in Berlin and Germany. More about this in another blog post to come. Still, it can be said that it’s crucial for the existing of public pools that there is a general societal and political agreement that the quality of life of all citizens benefits from the possibilities for outdoor swimming. Based on this agreement the government of Berlin has taken the decision that all existing outdoor pools have to persist in the future. This decision is backed by all political parties in majority and opposition. Something to dream of in Brussels! Side note: This blogpost is written almost 5 months after our trip to Berlin, only now we found the time for it. And today we received the news that the Berlin city council finally took the decision to set up a planning commision for the realisation of the Flussbad Berlin! 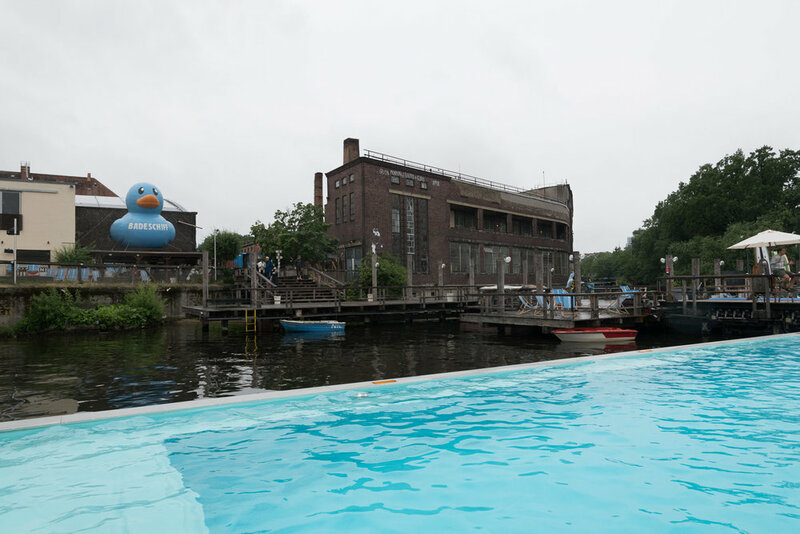 An important step towards swimming in the canal in Berlin. Bravo Flussbad Berlin e.V. for the years of hard work and persisting enthusiasm!